Techies Sphere: VMware vSphere Client Login Error (The type initializer for ‘VirtualInfrastructure.Utils.ClientsXml’ threw and exception). 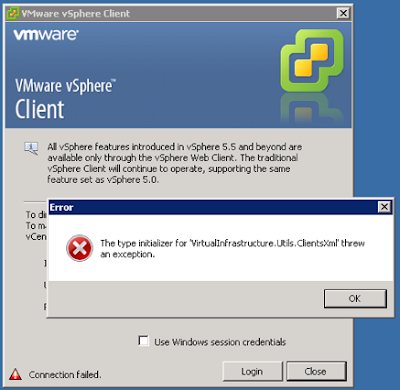 VMware vSphere Client Login Error (The type initializer for ‘VirtualInfrastructure.Utils.ClientsXml’ threw and exception). Or, getting error while login in vSphere Client (The type initializer for ‘VirtualInfrastructure.Utils.ClientsXml’ threw and exception). 2. Recreate your Windows User Profile. See Also: How to delete windows users profile? Hey I've been having this problem...what do you mean recreate your Windows User Profile? I use the client to connect to school VMs so I'm not super advanced. First thing first, Re-installing vSphere Client works well in almost cases but if that did not worked for you, you may proceed with approach-2 of recreating windows profile. Please refer the below KB for step by step instructions to re-create your windows user profile..
Hey, one more thing (very important to note): make sure you have copied/backup your profile folder to some other folder location or drive before deleting your profile from windows.